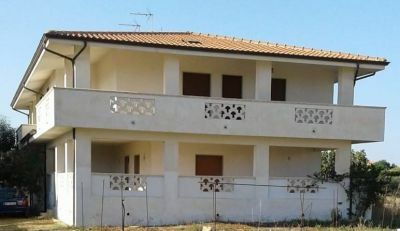 In the marine reserve of Capo Rizzuto (Crotone), sale portion of detached semi-detached villa, 180 meters from the sea. ground floor: large living area with kitchen, bathroom, double garage and veranda of about 50sqm. : a bathroom, 4 bedrooms, one with a predisposition for kitchen facilities, a storage room and a large veranda. Possibility to create two apartments as each floor is about 150 sq.m.